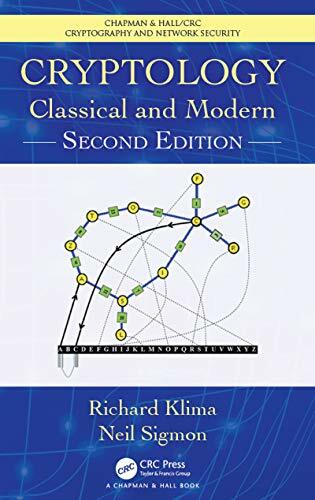 Cryptology: Classical and Modern, Second Edition proficiently introduces readers to the fascinating field of cryptology. The book covers classical methods including substitution, transposition, Playfair, ADFGVX, Alberti, Vigenère, and Hill ciphers. It also includes coverage of the Enigma machine, Turing bombe, and Navajo code. Additionally, the book presents modern methods like RSA, ElGamal, and stream ciphers, as well as the Diffie-Hellman key exchange and Advanced Encryption Standard. When possible, the book details methods for breaking both classical and modern methods. The new edition expands upon the material from the first edition which was oriented for students in non-technical fields. At the same time, the second edition supplements this material with new content that serves students in more technical fields as well. Thus, the second edition can be fully utilized by both technical and non-technical students at all levels of study. The authors include a wealth of material for a one-semester cryptology course, and research exercises that can be used for supplemental projects. Hints and answers to selected exercises are found at the end of the book.